Having left Chicago in June for a summer tour of America it is appropriate that upon arriving in San Francisco that we found a poem about the land itself. 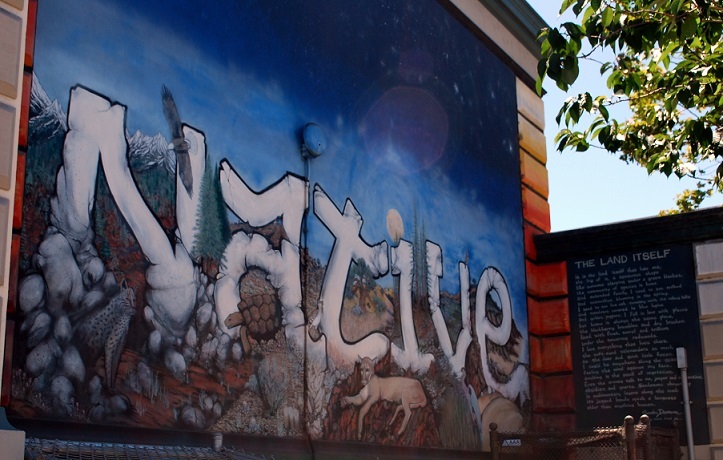 The poem — The Land Itself — and mural — Native California — are two of many at the Leonard R Flynn Elementary School on Cesar Chavez Street in The Mission District that we will look at. like someone sleeping under a green blanket. and ceanothus blooming in the spring. as the deer and quick little foxes. exulting in the smell of vegetation. The Bar None Group strives to give proper credit whenever possible. Unfortunately, we could find no information on the poet of The Land Itself, Sandra Dausmann other than her name at the end of the poem. While we were able to place the title of the mural as Native California we could not locate the artist's name on the mural or online. If readers can help us shine the spotlight on the poet or muralist please enlighten us by leaving a comment.